Where Danger Lives is back with a new film poster countdown — this time around the subject is NEO-NOIR! Unlike the classic film noir period, which lasted less than two decades, neo-noir has been part of the cinematic landscape for fifty years. So don’t be surprised to see a poster that was created in the 60s next to one for a film that was released a year or two ago. 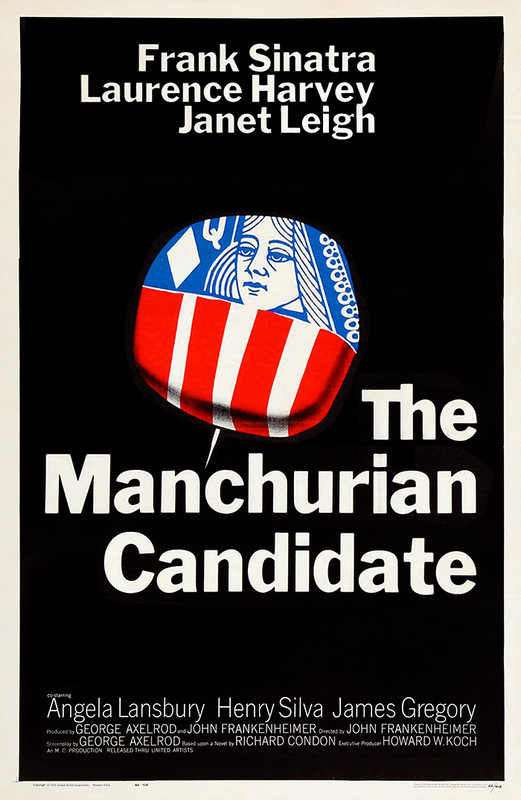 It was certainly a challenge to sort through all the candidates, and then to lend appropriate consideration to the evolving style of poster design, as well as printing and production techniques spanning such a broad length of time. Who the heck am I to be doing this? In the real world I’m a university graphic design professor and longtime professional designer. My designs have appeared in what professionals refer to as “the annuals,” (like Print, How, and Graphis) more than 300 times — and I’ve been collecting film posters for as long as I can remember. Before we plunge into the posters themselves, let me refresh you on the ground rules: First and foremost, this countdown is about design. This is a ranking of poster designs, not of the films themselves. 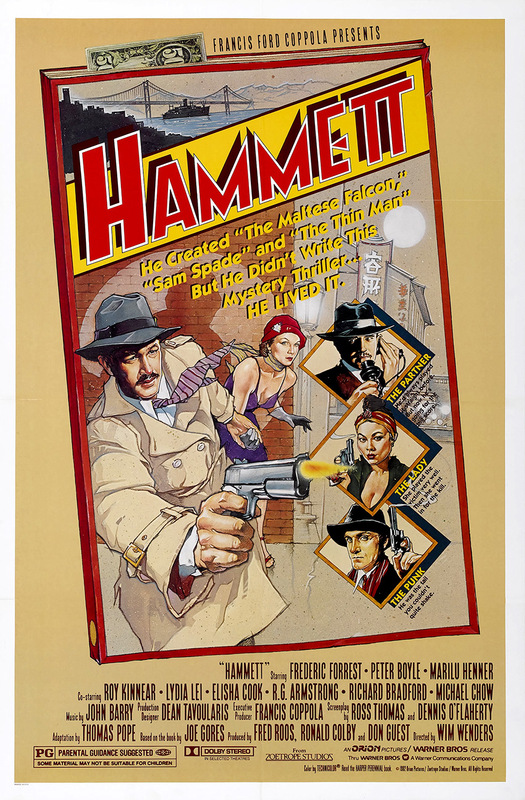 First-run, theatrical release one-sheet posters for American neo-noir films from the past five decades, For the sake of having more posters to choose from, my definition of neo-noir was much more relaxed than it is when I’m writing about film noir. Design and Artistic merit. Composition, color, balance, typography, strength of illustration or photography, graphic power, etc. Concept. How well does the poster communicate the film’s message? Is the poster true to the film? Is it misleading? Does it reach the intended audience? Originality and Novelty. I reward artistic risk-takers! The Blank Slate rule. All films are equal. Chinatown’s poster doesn’t get an advantage for representing one of the great American films. My personal taste. The least significant of the criteria. My choices are guided primarily by the above criteria, though my personal preferences must come into play somewhere. And while any such list is by nature subjective, not all opinions carry equal weight: I’ve spent the entirety of my adult life teaching design and advertising professionals how to successfully tackle design problems and communicate their clients’ messages. Let’s get started! Download all you like! A solid poster to kick this thing off. 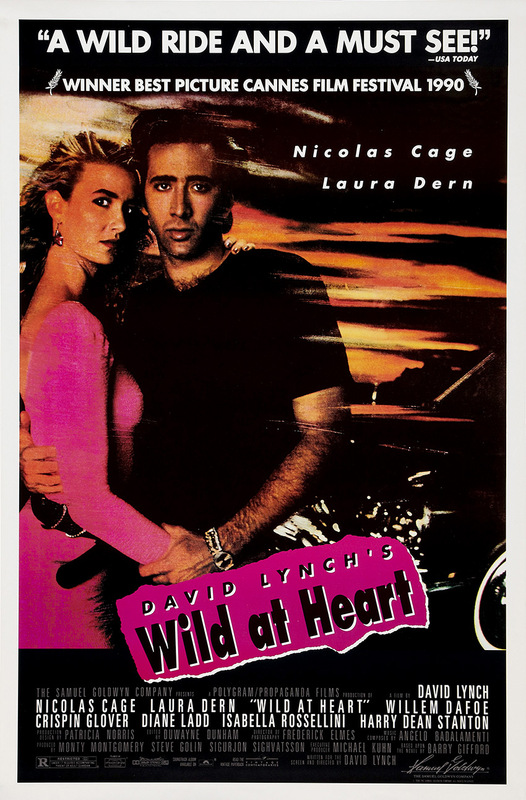 Classic noir really influenced the way I chose to rank certain posters, and Wild at Heart is a good reason why. Although the style in play here is clearly indicative of the years of the film’s release, the presentation of the ‘fugitive couple,’ situated by their car against a night sky. It harkens back to a dozen vintage noir films. The poster is vibrant, kinetic, and sexually charged — this pair never looked better. 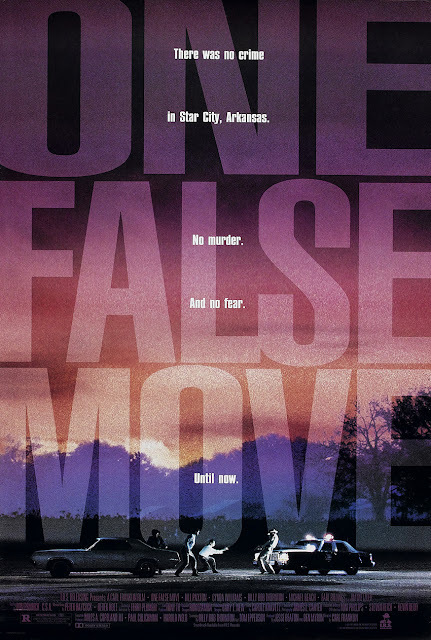 I don’t love this poster, but it is one of the better examples of a stylistic cliché that ran amok in movie posters from the 80s and 90s: the glamour shot knocked out of some defining shape, set against a (typically) white background. Stowe and Costner are awfully good-looking, but I dislike how they stare directly into the camera. What really makes this work is the interesting hand shape, and the nice detail of the fingerprints. The smeared wrist is indicative of impending violence — which is subtly reinforced by the small silhouette of a gun-toting Anthony Quinn — himself no longer pretty enough to rate a mug shot on the poster, in spite of second billing! A trio of 90s posters to start the countdown. 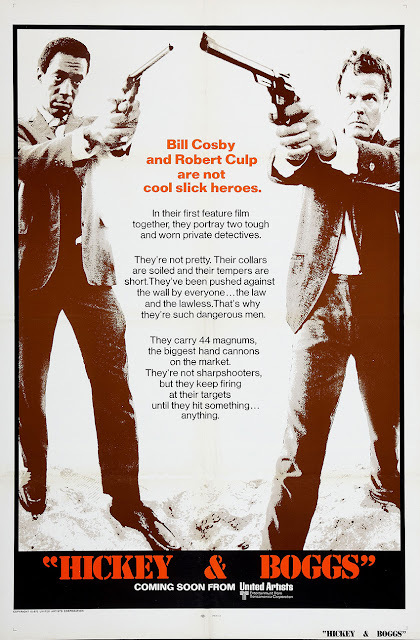 If you are waiting for those gritty classics from the 70s, stick with me — they’re locked and loaded. One of the things I quickly realized when putting this together is that although the neo-noir era spans many more years than that of classic noir, far fewer films have been produced. 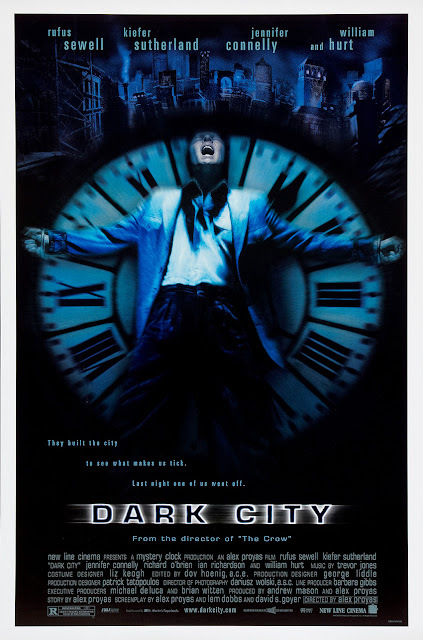 I selected this list from just over 200 posters (as opposed to 700 or so for the classic countdown) and was dismayed to find that so many of the neo-noir designs were not just not distinctive, but often painfully redundant and occasionally even insulting. 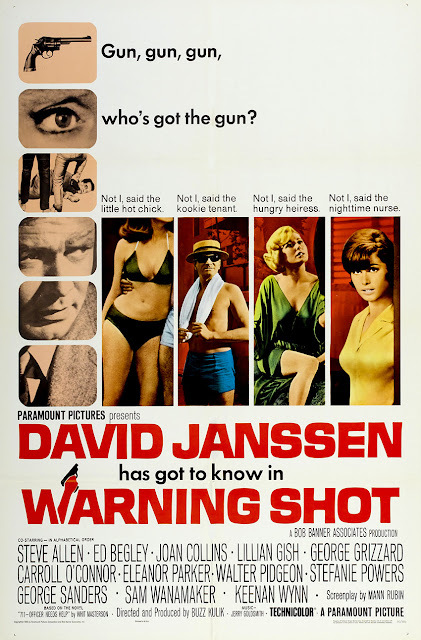 While the low budget classic noirs often boasted the best posters, the low-budget neos … don’t — tending to dwell exclusively on the female form, but without the panache that characterized so many of the classic designs. The poster for Mulholland Falls exhibits another one of those design clichés, in this case one that continues to dominate current Hollywood film posters: the floating head shots. That being said there’s a lot to love here. As a period film this is dripping with vintage style, and you have to LOVE a poster that actually depicts a character smoking. This poster is atmospheric and mysterious; and the view of L.A. from the hills is a powerful draw to fans of film noir. The deco-style type treatment was tedious by 1996, but it’s used sparingly enough in this example to still be compelling. Here we go with the big heads again, this time from 1987. I’m placing the poster for Black Widow one spot higher, if only for the sake of its earlier release. And even though this poster also uses typefaces inspired by the art deco period, I respond strongly not only to the claustrophobic relationship of the star names to the film title, but to the creativity of the title typography itself. 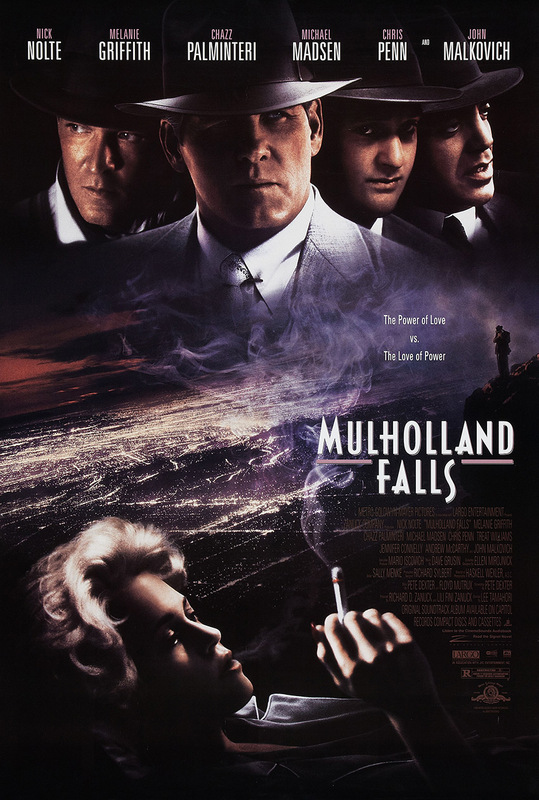 Certainly the poster lacks the atmosphere and the slickness of the Mulholland Falls design, but I’ll take Theresa Russell over Nick Nolte any day. 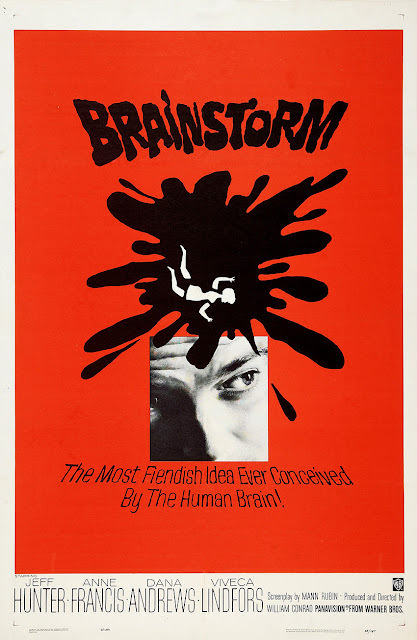 Clearly influenced by the iconic Saul Bass posters for films such as Anatomy of a Murder and Vertigo, the art for Brainstorm is amateurish in comparison, but scores a ton of points for being so offbeat. I like its stark simplicity, but have to cringe a little when I think of the extraordinary two-color film posters produced by Warner Bros. in the previous decade. The patented white frame is still there, as is the strict organization of the text at the bottom — but this is merely a shadow of what had once been. 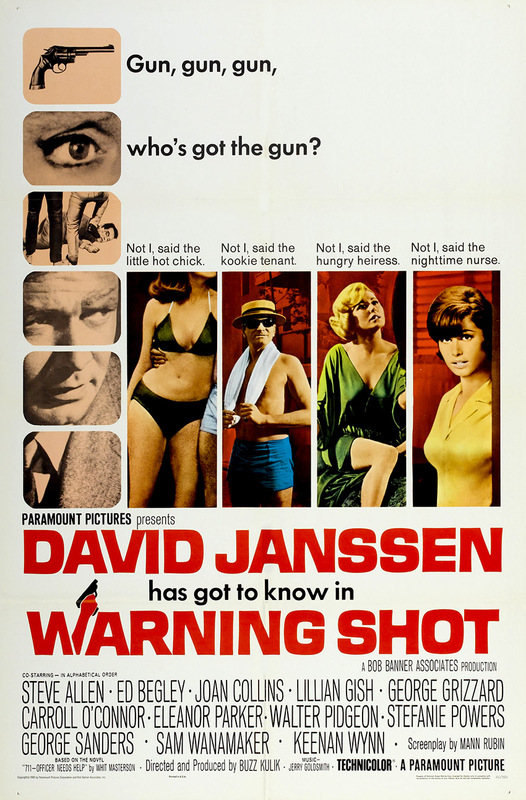 Famous faces galore populate this off-beat Paramount product starring David Janssen, of The Fugitive fame. I’m a little unclear on whether this film was made for the small or large screen, but the poster is engaging: well organized spaces and interesting title typography. I’m liking the playful language, and the fact that the poster design isn’t overly concerned with all those guest stars. Fuller’s strange cult classic is one of the original neo noirs, and the poster is one of the few you’ll see here that is done in the classic style. Three distinctive image areas create a sense of depth and dramatic scale, while the big tagline at the top keeps your eyes from leaving the composition. Not enough negative space, but I applaud the designer for not spoiling the film’s big secret, as the designer of the film’s Criterion DVD packaging recently did. The poster for The Naked Kiss is more appealing at first glance to me, but upon further consideration I realized there’s more to appreciate in the design for The Outfit than is apparent at first glance. This is one of the first posters to so exhaustively utilize photo collage, and although some of the images at the bottom aren’t very compelling, it’s worth remembering that this was created well before the computer era. And while there seems to be no underlying grid structure to ground the type, the poster’s ample negative space really brings the photocomposition to life. Get a load of that 70s MGM logo — yuck. What a hot mess this thing is — the designer in me aches. There’s so much happening in this poster — good and bad — that it becomes extremely difficult to rank. 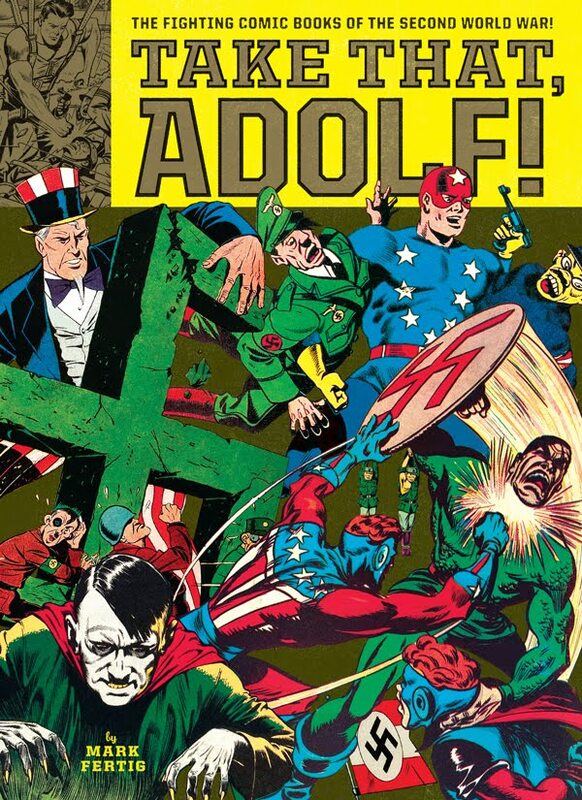 On one hand, the title typography and the accompanying political pin / playing card image is astonishing — the perfect distillation of the film, and one of incredible graphic power. On the other hand is just about everything else: the silly tagline, the crushing / crowding weight of the stars’ names, and the confusing illustrations at the top. Here’s a poster that could have been one of the all-time greats, but the studio couldn’t leave it alone. Just for fun, I’ve tossed in a quick Photoshop iteration of what I think this poster ought to have looked like! I’d rank this is higher if the title typography had the same grit as the image. Instead it’s more evocative of science fiction. Nonetheless, the clock motif and the isolated, pained protagonist set against a bleak urban landscape is what noir is all about. We’ve already gotten a little taste of it in the posters for The Outfit and The Manchurian Candidate, but here’s the most prominent appearance so far of the design cliché that characterizes neo noir posters possibly more than any other: the protagonist who is shooting at us! In spite of the vast array of posters I’ve seen over the years, I wasn’t aware of how often this particular device is used in neo-noir advertising imagery. At the end of the countdown I’ll total them up, but in the meantime pay attention to how often this is used. As for this particular poster, score one for illustration and all-around retro style. The stacked “character” boxes on the right bring to mind the posters of the 50s, and I love the subtle visual surprised on the $50 bill tucked into the top of the design. All of the additional text type makes for an awfully busy poster though. If you do nothing else, read the short narrative at the center of this poster — who writes this stuff? That last line, “something … anything” — what nihilism! I’m not claiming that this is a pretty poster, or even a very well designed one — it isn’t. But it does have a healthy amount of camp value, and within the grand scheme of neo-noir posters, it’s certainly an original. 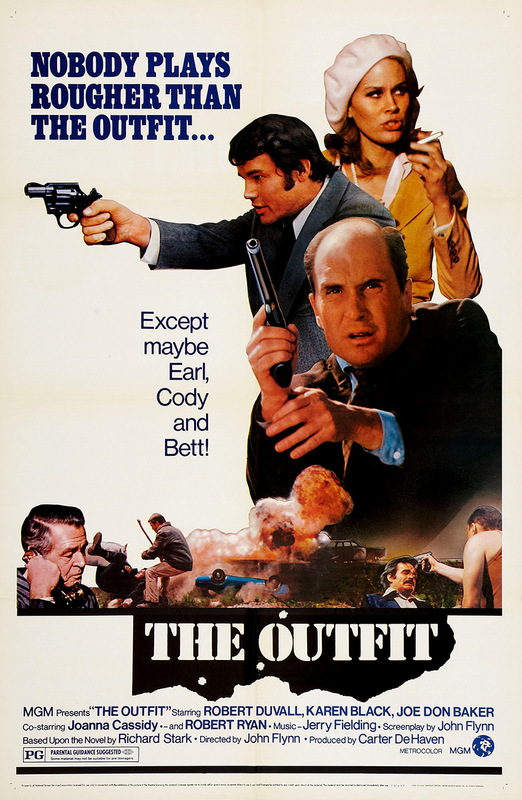 I would’ve actually rated this a little higher if the photos of Culp and Cos didn’t seem quite so obviously staged. Good poster in the classic vein, if only it wasn’t so pink! Nice concept and execution on the title typography, accompanied by a novel arrangement of the text elsewhere. By the early 90s the Apple Macintosh, along with software applications like Adobe Photoshop and Illustrator, Quark XPress, and Aldus Pagemaker and Freehand had fully revolutionized the graphic design industry. This evolving technology gave designers the power to play with scale, transparency, and mood with previously unheard of ease and versatility — all readily apparent in this poster. The full-bleed single photograph, layered with gigantic transparent typography, screams 90s to graphic design veterans, but it’s still a great poster. Also worth noting that the image depicts a cop killing — pretty daring stuff. 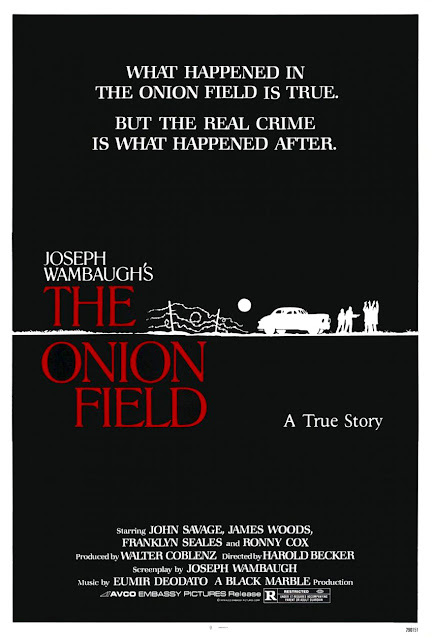 It’s no accident that I’ve paired the poster for The Onion Field with that of One False Move. They are practically twins! In spite of the slickness and technical virtuosity (for its day) of the previous poster, this one is superior. Both depict similar subject matter, but the designs differ along much the same lines that the films do. 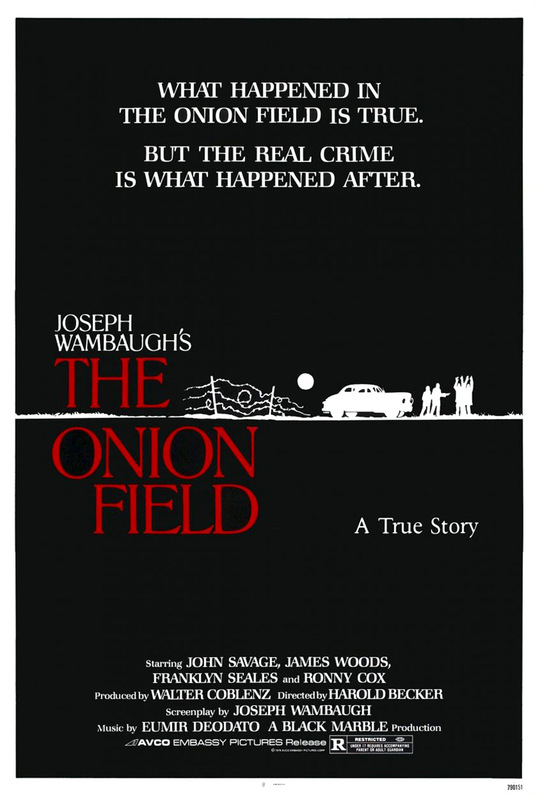 Where One False Move sensationalizes vivid, cinematic brutality, The Onion Field is a subtler, nuanced, and far more cerebral look at what happens after the crimes have been committed. Its quiet poster design appeals to the imagination and sense of mystery, asking viewers to consider “What’s about to happen?” rather than the poster for One False Move, which instead pleads for your attention. See you in two weeks for the next fifteen posters! Fantastic as always, Mark. 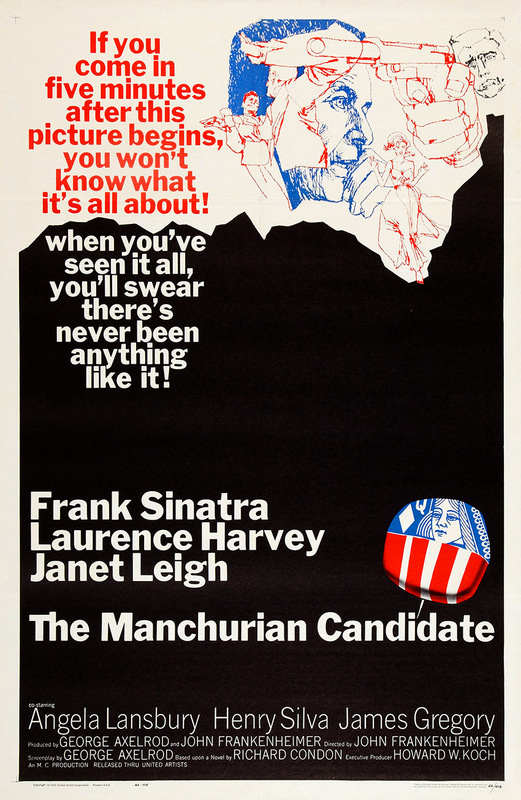 Love your modified poster for The Manchurian Candidate. You nailed it. Hey Michael, I feel exactly the same way. Too bad about your theater — mine actually let me have them. The only problem is that I have no idea what I did with them! Terrific premise for showing more posters! Tho I disagree on one point - I enjoy reading your POV, you add much to the conversation. Now about "Wild At Heart" ... all I see is hammy actor with hairy arms". "hammy actor with hairy arms"
I love this! 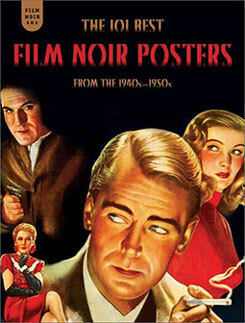 I've been meaning to watch more Neo Noirs so looking for these posters will be great for finding new films too. 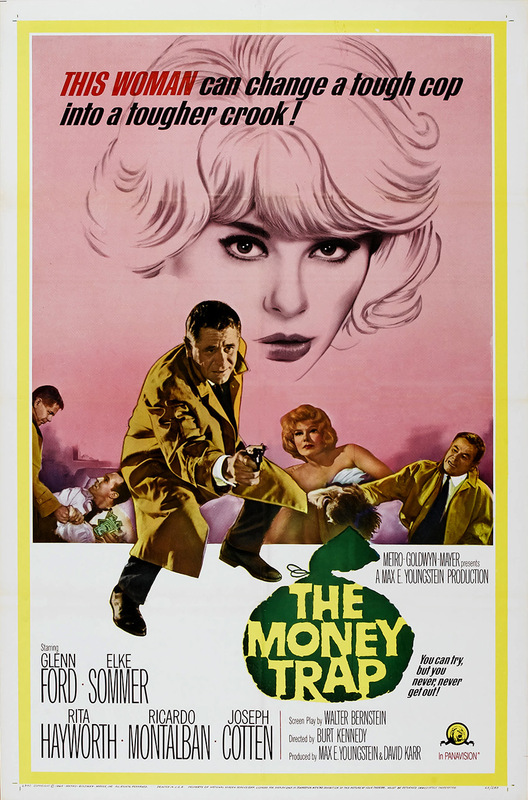 I love that poster for The Money Trap. Never heard of it and will check it out soon. Thanks Raquelle - I hope you make some new discoveries. The Money Trap has been airing a few times each year on either TCM or FMC, shouldn't be too hard to track down. Cheers!